The problem of making future predictions about the destiny of long-lived nuclear waste. Depending upon what you put into a nuclear power station and how you operate it, you get different products out. Most reactors use uranium dioxide fuel, UO2, and over 90% of the “spent fuel” is still uranium compounds, with a little plutonium. Although it is called spent fuel, so much uranium still exists that it may be recycled to generate more electricity and remains hot for years. However, “ash” products that absorb neutrons and slow the reactions build up as the fuel operates, the rate that energy is produced drops and stops being efficient. Then the fuel will be replaced, useful uranium extracted and recycled and the rest disposed of. Some kinds of reactors extract more energy and are more efficient, such as fast breeder reactors. These make products like plutonium-239 (Pu-239) that sustain the chain reaction - nuclei falling apart and giving off energy. When the rate plutonium-239 is produced is faster than it is used up, the reactor can get 60 times as much energy from the original uranium and more plutonium products result. However, there are no fast breeder reactors in the UK because plutonium-239 is one component used to make nuclear weapons - not something you want to be storing in large quantities. Plutonium-239 and other minor actinide products of nuclear power generation remain dangerous for over hundreds of thousands of years. Although the longer a radioactive material remains dangerous, the lower the danger (because they produce radioactivity more slowly), fresh spent fuel is so concentrated that standing unprotected before it would get you a lethal dose in seconds, and you would die of radiation sickness in days. How can we store nuclear waste? An important fact about radioactive waste is that radioactivity decays away with time. This means that the same reason it is dangerous is also the reason it will eventually stop being dangerous, unlike other forms of waste, especially CO2, which just build up and up until a separate removal process intervenes. Most fuel is now stored underwater at power stations: water is a good radiation shield and carries off excess heat, but this is not a long-term solution. Once the radioactivity has dropped low enough that we can use lead and concrete to shield it from ourselves, the plan is to put nuclear waste into geological disposal facilities miles deep in the earth, where it can remain for 100,000 years or more - until it is safe. This is where radioactive materials come from in the first place, but because of the concentration and volume of spent fuel, it must be encased in copper or steel canisters and coated with concrete or clay. Having said this, the volume of waste produced by the nuclear energy industry per unit energy generated is tiny compared with that of the fossil fuel industries, and the number of deaths per unit energy lower than everything except wind. It is even safer than solar panels, which are manufactured containing toxic components. 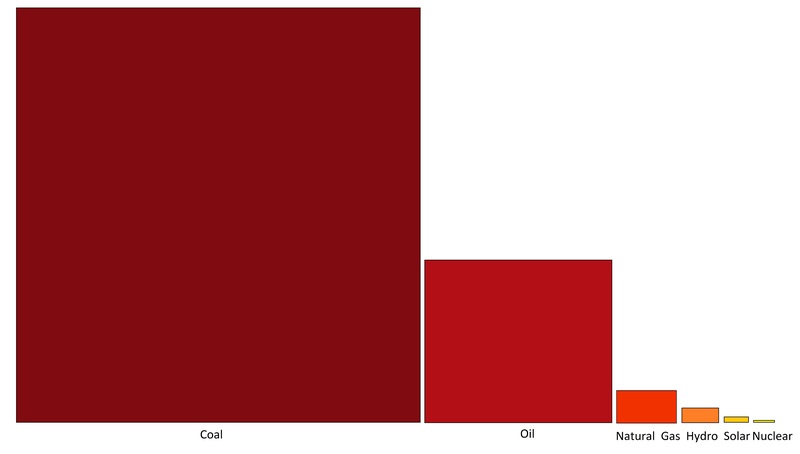 Rough representation of annual number of deaths per unit of energy derived from each industry. Image by Things We Don't Know. Data source: Pandora’s Promise (2013). Is nuclear waste being buried underground? There are currently no geological disposal facilities operating in the world - but some are being built. Onkalo in Finland consists of a 5km long, 400m deep tunnel that starts at the doorstep of the Olkiluoto power stations and zigzags down to an array of storage vaults capable of holding 100 years worth of nuclear waste. Whilst the Finns plan to open Onkalo in 2020, in the UK viable sites for such repositories are yet to be identified. Perhaps the most advanced project planning comes from Sweden. SKB, the Swedish Nuclear Fuel and Waste Management Company, have already developed and are continuing to develop the most comprehensive Safety Case and Environmental Impact Assessment with the aid of national and international collaborations. This involves looking into all aspects of nuclear waste storage before their chosen site at Forsmark may be approved and established, including heat generation, leaking, bacterial intervention and geological changes such as rock movement. Diagram of nuclear waste canister and their storage in an underground facility. Image copyright: Courtesy of Swedish Nuclear Fuel and Waste Management Co.
A lot can happen in 100,000 years - and this number is so big it can only be a rough estimate of how long it will take radioactivity to fade. It could take longer. Or shorter. Designing something to last for 100,000 years is a mammoth task: most buildings are never planned to outlive a century. The 5,000 year old pyramids look like babies beside this challenge, and even they are showing signs of substantial wear and tear. When planning for nuclear waste storage, to ensure it remains safe and sealed for long enough, we have to take account of every slow geological and environmental process that could possibly come into play - things we can only guess about. Rocks deep in the earth will certainly move over 100,000 years, but we don’t know how much or in which direction. Geologists need to make sensible guesses and model patterns using knowledge of the currents in the mantle and the movements of tectonic plates. If the rocks move together, squashing the nuclear waste, this could cause stress corrosion cracking, so much rock weight gets dumped on the canisters that they bend, crack and corrode around the cracks, eventually opening up. Although it is easier to corrode metal once it has been cracked, even pristine stainless steel can corrode given enough time. The question is how much. This depends upon several factors, including how hot it gets, how wet it gets and whether there is any salt in the atmosphere. Warm, wet, salty environments accelerate corrosion and would make less than ideal nuclear waste disposal sites. Because of the long timescale, predicting these factors isn’t as simple as measuring the atmospheric humidity and sealing off the zone. Scientists have to estimate climate change, rising sea levels, the porosity of surrounding rock (and so how easily water and air can seep through) and the possibility of changing coastlines. In 100,000 years, we will probably have been through another ice age. It also means estimating every eventual possible scenario, the mobility and solubility of different radioactive isotopes, and testing to see how the integrity of the canisters and leakage of waste is affected. We want to know how fast corrosion occurs under different conditions, because this can help with design factors like how thick to make the walls of the canisters. 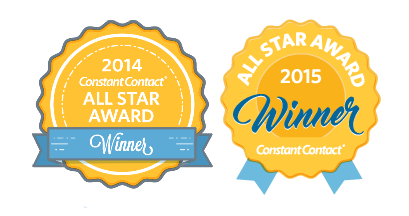 Bacteria can also affect corrosion rates. It is impossible to create an atmosphere that bacteria can never penetrate - in 100,000 years - so it makes sense to assume some will get through the concrete and clay surrounding the canisters. There are bacteria out there that eat iron and copper, and these bacteria will facilitate corrosion. Bacteria also evolve very quickly; the bacteria that exist in 100,000 years, or even in 100 years, may be unrecognisable from the ones we are familiar with today. We also want to know how different metals, primarily copper and stainless steel, corrode under different conditions. This matters because some kinds of corrosion are more likely to lead to leaks of the canister contents - the radioactive waste. Some corrosion occurs shallowly over a broad area, other corrosion causes the formation of small, deep pits, which are much more dangerous. Corrosion can also affect the integrity of surrounding clay concrete, changing its chemistry and so how good a barrier it is. Hydrogen gas given off during corrosion processes can build up a pressure and eventually crack the clay/concrete barrier, providing a route that rogue radioactive particles might escape by. Predicting corrosion rate can help predict the volume of hydrogen gas produced. Why is making future predictions hard? Corrosion is a very slow process. We can’t test how far metal would corrode in 100,000 years directly - that would take 100,000 years - but we can accelerate conditions to test corrosion rates, such as by heating samples or exposing them to unrealistically harsh corrosion conditions. This obviously tells us nothing about the corrosion rate, but we can compare more and less accelerated samples to make estimates. We also can’t be sure whether the accelerated conditions accurately model what would happen in slow time, or whether changing conditions drive different mechanisms for the corrosion process. This can be explained using the chemistry of activation energy: the idea that a reaction needs enough initial energy to get over the hump of the transition state before dropping down to a product of lower overall energy. If there is more than one possible reaction, the activation energies may be different. When very little energy is supplied, only the lowest activation energy path reaction occurs; when more energy is supplied, the higher activation energy route is viable, and whichever leads to the lowest energy product (the thermodynamic product) will be favoured. 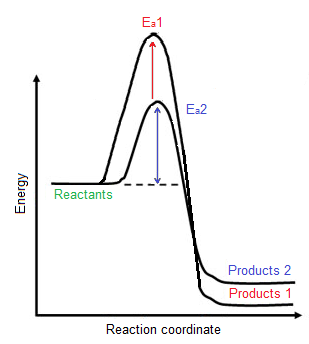 This diagram shows two possible reactions: the red path, which has a higher activation energy and lower energy thermodynamic products, or the blue kinetic path, which has a lower activation energy and less stable, higher energy products. The possible existence of different reactions or mechanisms in corrosion could make acceleration meaningless for predicting the future. Importantly, different mechanisms may affect corrosion rate, but are more likely to generate different products, which themselves could influence future developments. Whilst these processes themselves are slow and tame, nuclear waste security is highly important, and the overwhelming number of factors make future predictions tricky - which future should we test for first? There are still so many untested permutations. Even straightforward processes are difficult to extrapolate; existing trends do not necessarily continue into the future, so perhaps there will always be an element of the unknown.